"I'm never gonna be able to remember your names because there's not enough time so you're Red One, you're Red Two, you're Red Three, and you're Red Baby. " Somehow the words "high concept" have clearly been dropped from the vocabulary of action hero (hey, it says it on the back of the packaging) Vin Diesel. After showing great choices and promise in early films including Boiler Room and Saving Private Ryan, the actor has hit a wall in terms of success and creativity in his selections. Here, he turns to the land of family pictures that have offered salvation to the likes of Arnold and others. The bad news for Diesel is that The Pacifier is awful and completely devoid of a single praiseworthy aspect. The good news is that now it appears he can at least run for governor. Once in suburbia, Wolfe finds himself in the position of protecting not just the house but also the Plummer children as their mother Julie (Ford) takes off to Geneva to locate the late proffessor's safe deposit box. Meanwhile, back at home, Shane is forced to deal with the problems of Lulu (York), Zoe (Snow), Seth (Thieriot), Peter (Keegan and Logan Hoover), and the young toddler, Tyler (Bo and Luke Vink). As the kids lack discipline, Wolfe turns the home into a military base with strict rules that of course the older children rebel against, pushing Shane further away. Along the way we meet a vice principle who is an overgrown bully and a principle (Graham) who is not only gorgeous but also has a military background that makes her a match for Shane. It is likely that The Pacifier is never given a decent chance because every plot point and the outcome are clearly defined within mere moments of the opening credits. Wolfe will soften and the kids will love him, secondary characters will become something more after saying just one previous line of dialogue, and of course all of the problems that the children have will be straightened out. There are a few smiles to be had along the way but for the most part the script by (gasp!) Reno 911 stars Thomas Lennon and Robert Ben Garant spends too much time telling us what is happening rather than showing us. The films gets bogged down in exposition that doesn't really matter, and its better moments come from the interaction between Shane and the children, not the useless military subplot. What does it say about a film where Julie stands in the office of a Swiss bank and tries to guess the password for two weeks. I can only say that I hope for the sake of those invested insuch institutions that this is not exactly allowed. Equally as guilty as the screenwriters is director Adam Shankman, who puts too much importance on the punchline that the setup becomes irrelevant. On more than one occasion Shankman meanders through the important scenes simply to get to a moment where Shane must put his hand into a dirty diaper or another disappointing potty gag. Diesel acquits himself in a strange way; he takes the material seriously, which shockingly helps. It only goes to show how ridiculous the rest of the film is when Diesel offers the emotional core. Image Transfer Review: The 2.35:1 anamorphic widescreen image for The Pacifier is in no way a reference quality transfer but it gets the job done. Sharpness and detail are done well but the transfer suffers from noticeable softness throughout. There are some slight instances of edge enhancement while colors are well defined with no bleeding evident. Audio Transfer Review: The Dolby Digital 5.1 mix for The Pacifier is more than I expected from a family comedy with some of the better sound design I have heard recently. The opening sequence involves some very nice directional effects and some rich, deep bass. Dialogue is nicely mixed with no distortion or dropouts. Extras Review: I will admit that my interest in The Pacifier DVD was based solely on the inclusion of a commentary track by director Adam Shankman along with writers Thomas Lennon and Robert Ben Garant. The track is a letdown to say the least as it becomes a mirror image of what is occurring on the screen, though there are some flashes of interesting information. There is a hint that the trio have a low appreciation for the material and toss jokes back and forth about what is happening on the screen. Five deleted scenes are included and aside from a scene boasting more interaction between Garrett and Diesel, the excised material is a waste of disc space. A collection of outtakes are also included and with a running length of just over two minutes; it is an easy watch but there are very few laughs. Profiles on both Garrett and Diesel are included. 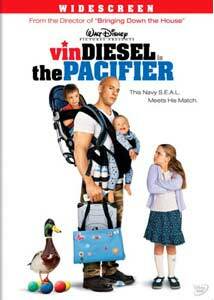 Though likely entertaining for children and families, The Pacifier offers nothing redeeming. Though it will likely be a huge success on home video, the film is yet another instance of the dumbing down of American audiences.